Cheat walk-through video in case you get stuck. Also to quickly gain more hearts (Life) before defeating a boss sleep in the bed for free outside of the elephant and else where to get temp hearts. Where in the menus do I turn weapon durability off? are we back in 2017? Some of us just got the game @ black friday specials at Best Buy. I slowly just started playing. I come to this board everyday waiting for another BOTW thread to pop up. This was such a fun game. Any advice on how to mark my map the symbols are confusing. I just found my map was not zoomed in on. Zooming in you can really see everything. The map is huge. Also in the elephant using ice to break the ice is what I did when others said they wasted arrows. I had trouble shooting the four orbs while flying down. Here is the OG BOTW thread on here. It's full of useful info and tips, and was alot of fun to read everyones reactions and thoughts while playing. Any advice on how to mark my map the symbols are confusing. I didn't use this function at all. I found it to be basically useless. Don't even try to get all the koroks. Not worth the time. You'll pick up enough to have ample inventory slots without even having to put effort into it. ETA: If you level up your gear too much, the game won't be challenging anymore. I wish YouTube was around back in the OoT days. It took far too long to save up for the damn game guide book. I'm that type of person who starts and finishes the game with the first weapon so it bothered me at first. Then after the first few hours I felt like I never dealt with it again. I just had to embrace not getting attached to anything. I get sweaty palms just thinking about that hell hole. I leveled the ancient armor all the way up just to finish the game. With a 2 year old at home, I felt like I needed to finish it but didn't have time to make it overly challenging. Now, I enjoy picking the game up every now and then and wandering around looking for bokoblin camps to just decimate. It feels good doing it after I used to struggle so much, especially when a Moblin was in the crew. I remember the monsters that were terrorizing the beach at the base of the mountain on the backside of Heteno. There was some sort of quest to kill them all. I attempted it in the first 10 hours or so of the game. It took me forever to do it because all I could do was lob bombs from a hiding spot. Now, I could go in there with a stick and wreck them. Feels good. 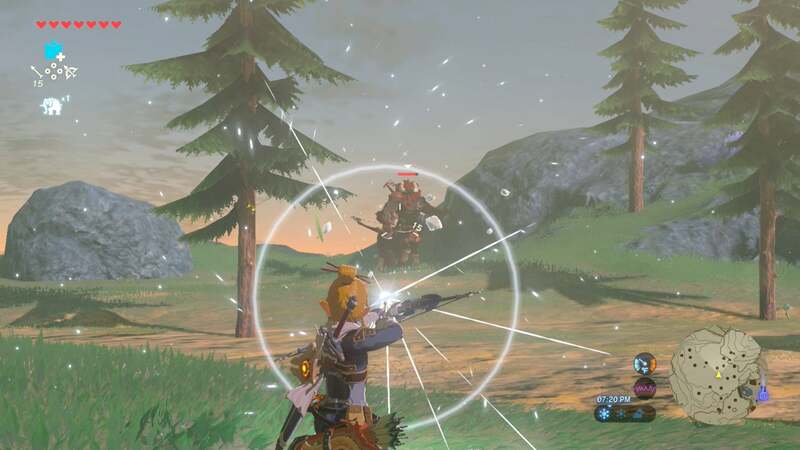 I stole a bunch of shock arrows and now am prepping to go kill this Lynel half horse man. When I was stealing shock arrows he scared the shite out of me. I hope to go now and get him. I got through 3 divine beasts before I put it down. I have some free time this weekend, and may pick it back up for a few hours. Waiting on the new season of Fortnite next week, so I need something to keep me busy. Do as many shrines as possible. Those test of strength shrines are fun and drop good weapons. Dont worry about weapons breaking.. eventually your entire inventory is nothing but flame, energy, ice etc weapons. Lol at people getting attached to the stick they get in the first minute. prioritize stamina over hearts early. Dammit, Jeff. How many times do we have to go over this? It isn't an "attachment" issue. It's the endless inventory management for crap weapons that last 2, maybe 3 encounters, tops. It's tedious to the point where it's stupid. No, I don't miss my sticks. I'm just tired of picking up every damn thing for a weapon because I know most of my inventory will be gone soon. I wouldn't mind the progression to the good weapons, and I can kind of get behind wooden weapons eventually breaking. But it pissed me off to no end when I'd get some battle axe or a legit metal sword and know that wasn't going to last me long either. Inventory management is reserved for ingredients, food, potions, attire, any number of things. But don't make me do it for weapons. I'd just as soon start using my fists on people instead of having to manage endless clubs. I know, it eventually becomes a moot point, but that system is so unbearable for the first bit of the game that I just couldn't make myself push through it. It's pure horse shite. I didn't kill my first Lynel until I had beaten all the beasts. I was terrified of them. Ninentendo needs to port another Zelda to the switch soon. My last Nintendo system before the Switch was the 64. I need some new Zelda in my life. Ninentendo needs to port another Zelda to the switch soon. My last Nintendo system before the Switch was the 64. I need some new Zelda in my life. Find a gamecube. Wind Waker. Twilight Princess. You're welcome. Get enough hearts to pull the master sword. Problem Solved. yes even the sword does have some form of breakdown, but it revives pretty quickly.